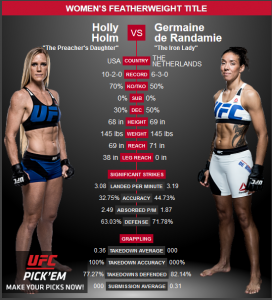 Former UFC bantamweight champ Holly Holm faces dangerous striker Germaine de Randamie in the inaugural women’s featherweight title fight on Saturday, February 11, 2017 in Brooklyn, New York at the Barclay Center. If injury pushes a Cyborg fight down the line—which doesn’t seem likely considering her recent call out of Invicta FC champion – de Randamie should fight Holm in a rematch. Holly Holm – After defeating Ronda Rousey in stunning fashion at UFC 193, Holm finds herself in precarious waters losing her three fights since.